It's all over but the shouting and the passing of the proverbial sugar. 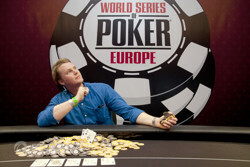 In just over seven hours of play today, Andrew Hinrichsen has completed his quest to achieve poker's most iconic prize, a piece of WSOP gold, adding nearly €150,000 to his pockets in the process. 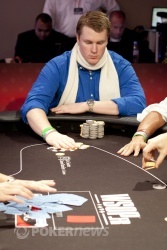 When the day began, Hinrichsen was second in chips, though still a long way behind chip leader Gianluca Speranza. And the Italian was flexing that chip lead in the opening levels. Speranza was responsible for the elimination of the ninth-place finisher Gregory Lejolivet in the first few minutes of the day, and he won a big flip with ace-king against pocket fives to send Eric Baudry out in sixth place. That gave him more than half the chips in play with five left, but his lead was anything but safe. Five-handed play lingered for a while before the table was able to bid farewell to a dangerous Welshman. Roberto Romanello came into this final table just eight players away from his first bracelet, and it would have made him only the fifth player to achieve poker's elusive Triple Crown. The day did not go as he had dreamt about last night though, and he soon found himself all in with his ace-deuce in awful shape. Bernard Guigon's ace-king was too much in the end, and Romanello was forced to settle for a consolation prize of €37,874 -- though it likely wasn't much consolation. Guigon was next to fall in fourth place (at the hands of Speranza), and the final three broke for dinner in a near deadlock for the chip lead. When they returned, things began to go south for Hinrichsen. Pot after pot was pulled from him, and he soon found himself badly in need of a double-up with just over 200,000 chips. Soon thereafter, though, he found that lucky double when his flushed Speranza's to keep him afloat. 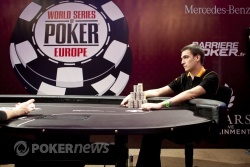 He continued to chip his way up close to 650,000 when he played another decisive, double-up-or-go-home pot. It was a flip with Speranza, and the of Hinrichsen managed to outrun his opponent's pocket fives to give him the chip lead for the first time. It wasn't much longer before the end came. In the last hand, Hinrichsen took Speranza to Valuetown with , and he ended up out-kicking his opponent on a king-high board to seal the deal. Speranza looked less than thrilled as they announced his name in second place, good enough for a big five-figure score. So then, Australia has another gold bracelet to add to its tally. That's six by our count, and this one moves Hinrichsen into Australia's all-time Top 25 winningest players. Hinrichsen had a small rail here to support him this week, but he sends his regards to everyone who was rooting for him back home. The drinks are on Andrew Hinrichsen tonight in Cannes, and Australia's newest bracelet winner has 148,030 new reasons to celebrate. Andrew Hinrichsen Takes Home the Loot! From the button, Gianluca Speranza raised to 42,000. Andrew Hinrichsen reraised to 100,000 even from the big blind and Speranza called to see the flop. The flop came down and Hinrichsen fired a bet of 115,000. Speranza reached for his chips and slid out a tall tower to make the call. The turn was the and Hinrichsen stayed on the gas. He upped his bet a bit and fired 200,000. With two tall towers this time, Speranza slid out the call. The river completed the board with the and Hinrichsen paused before announcing that he was all in. Speranza snap-called. Immediately, Hinrichsen tabled the for kings and threes with top kicker. Speranza held a weaker kicker with the . 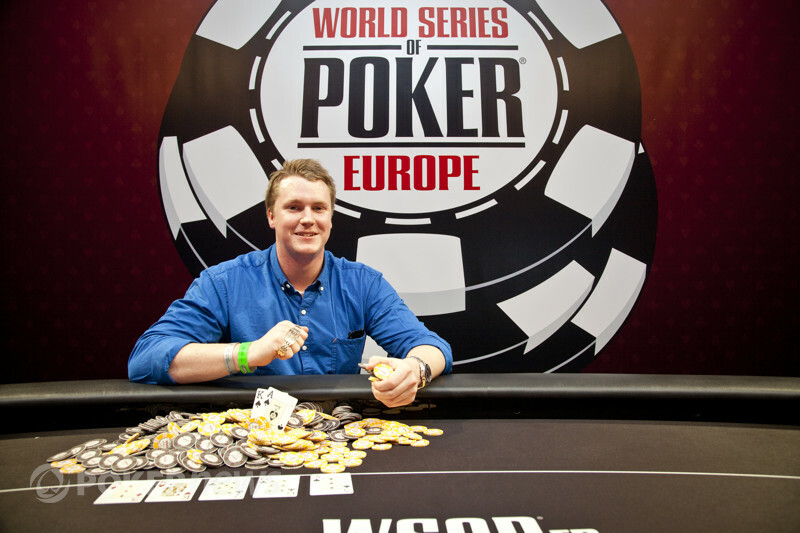 Thanks to his double up earlier, Hinrichsen had the chip lead and eliminated Speranza in second place to earn the victory and his first-ever World Series of Poker gold bracelet! Heads up for the loot. It looks like Gianluca Speranza is going to have a bit more trouble with Andrew Hinrichsen now that the Italian has relinquished the chip lead for the first time today. In the last pot, Hinrichsen opened to 40,000 on the button, and Speranza three-bet him to 120,000 total. Hinrichsen took his pause, then stacked out another raise to 245,000 total. Speranza couldn't stand the heat this time, and he uncapped his cards and slipped them into the muck. Andrew Hinrichsen raised from the button to 40,000. Gianluca Speranza three-bet to 124,000 from the big blind. Hinrichsen reraised all in for 646,000 and Speranza quickly called. The flop came down and put Hinrichsen in front with a pair of tens. The turn was an interesting card as it brought the and gave Speranza nine more outs to a club flush. The river was safe for Hinrichsen when the fell. With that double, Hinrichsen now has the chip lead. From the button, Andrew Hinrichsen raised to 40,000. Gianluca Speranza called from the big blind and the flop came down . Speranza checked and Hinrichsen checked. The turn was the and both players checked again to see the land on the river. Speranza bet 62,000 and Hinrichsen gave it up. The players are back in action.